There are approximately 80 million CT examinations performed in the United States annually. About 7 million of these occur on children (Mettler 2000). In response to this, the Society for Pediatric Radiology (SPR) sponsored a conference on this topic in 2001 (Slovis 2002, Berdon 2002) which was followed by a conference in 2002 sponsored by the National Council on Radiation Protection and Measurements (Linton 2003). 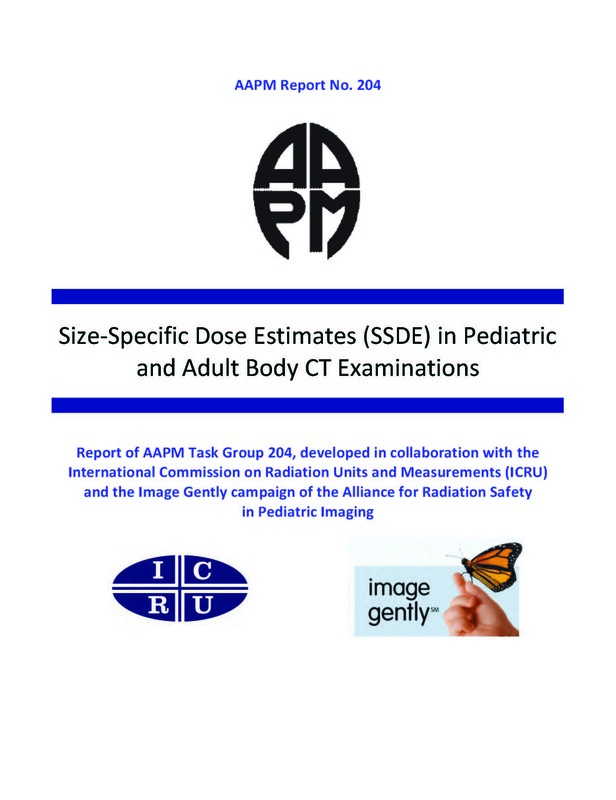 In 2008, the Alliance for Radiation Safety in Pediatric Imaging ("Alliance") was founded by the American Association of Physicists in Medicine (AAPM), the American College of Radiology (ACR), the American Society of Radiologic Technologists (ASRT) and the Society for Pediatric Radiology (SPR) to address the unique needs of imaging children when using ionizing radiation. Currently, the Alliance represents over 60 affiliated organizations (at least 20 are international) representing over 750,000 people working in medical imaging. The Alliance promotes radiation protection for children through an awareness, education, and advocacy-based social marketing campaign (Image Gently). The Alliance strives to foster justification (examination indicated) and optimization (appropriate balance between radiation dose and study quality) for every pediatric CT examination. In order to achieve this balance, pediatric radiologists, medical physicists and radiologic technologists need user-friendly computational tools to estimate radiation dose during pediatric CT examinations. The methods provided in this document are designed to provide such tools, not only for pediatric CT, but for CT examinations of patients of any size. Current CT scanners display the volume computed tomography dose index (CTDIvol) and the dose length product (DLP) dose indices (Shope 1981, Dixon 2003, Boone 2007, McCollough 2008, McNitt- Gray 2002, AAPM 2008), both before and after the CT scan is performed. This has been required of manufacturers since 2002 (IEC 2002). CTDIvol was developed to provide a standardized method to compare radiation output levels between different CT scanners using a reference phantom. DLP, which is the product of CTDIvol (mGy) and scan length (cm), is related to the total ionizing energy imparted to the reference phantom. Both CTDIvol and DLP are sensitive to changes in scan parameters such as tube voltage, tube current, gantry rotation time, pitch, and bowtie filter, but are independent of patient size. The CTDIvol is determined for either a 16 cm or 32 cm diameter polymethyl methacrylate (PMMA) cylindrical reference phantom, often called the "head" or "body" CTDI phantom, respectively. For a given patient's CT scan, the CTDIvol and the related DLP are displayed for a reference phantom (i.e., head or body CTDI phantom), the diameter of which (i.e., 16 cm or 32 cm) is selected by the scanner. In general, for exams using a head bow-tie filter or head scan protocol, the 16 cm diameter phantom is used. For exams of the torso, when a body bow-tie filter or body scan protocol is used, the 32 cm diameter phantom is used. At present, for pediatric body CT protocols, some manufacturers use the 16 cm diameter phantom and some use the 32 cm diameter phantom as the reference for calculating CTDIvol and DLP. To accurately interpret CTDIvol or DLP for an individual patient, or to compare to other reported values, the phantom diameter used for a specific scanner model and software version must be known. In most cases, the phantom diameter used is now displayed on the user console along with CTDIvol and DLP, or is present in the DICOM Dose Report. Older scanner models and software versions, however, may lack this information in a readily accessible place and the scanner manufacturer representative should be consulted in such case. The dose received by a patient from a CT scan is dependent on both patient size and scanner radiation output. CTDlvol provides information regarding only the scanner output. lt does not address patient size, and hence does not estimate patient dose (McCollough 2011). This is a concern, because for smaller pediatric patients, interpreting the displayed CTD/vol (or DLP) as patient dose-without recognizing the distinction between the two-could lead to underestimating patient dose levels by a factor of 2-3 if the 32 cm PMMA phantom was used for reference. This task group was charged with developing conversion factors that can be applied to the displayed CTDlvol dose index to allow practitioners to be able to estimate patient dose. These factors take into account patient size, and hence are especially important for pediatric CT or when small adults are scanned. The work presented here was specifically motivated by the needs of the Alliance (Strauss 2009), but also reflects ongoing, independent research performed by a number of research groups around the United States. The scope of this task group is limited to estimating patient dose using scanner output (CTDlvol) and factors associated with patient size. Other differences between the current CT scanner radiation output indices and patient dose estimates due to the use of "short" phantoms (15 cm along the z-axis) for CTDlvol measurements (Dixon 2003, 2006; Boone 2007) are not addressed by this task group.